FAR out on the western spiral arm of the galaxy is a small blue-green planet called Earth. The ape-descendant inhabitants of Earth are still a bit on the primitive side, for although they now know that digital watches are not the peak of technological achievement, they still get very excited by personal CD players. They also spend a great deal of time and money building themselves various electronic computing devices to perform routine tasks, such as payroll accountancy and word processing, in an attempt to save time and money. Then one day, a man with a rather bad cold walked into a computer shop somewhere in England and bought a Vic 20. This man was called Jeff Minter, and this is not his story. Instead, it is a story what he has created, his favourite animals and some of the best rock music ever recorded. In other words, it is about computer games, llamas and Pink Floyd. If you have never heard of Jeff Minter, or "Attack of the Mutant Camels" then either I am getting old or you have lived a sheltered life. Minter's games have a simple approach to things. You shoot them. Many ape-descendants find this activity strangely relaxing. The complete non-use of their brain (achieved by linking a joystick directly to the eyes via an overworked central nervous system) can cause great enjoyment. The Earth inhabitants who own Amiga computers have been unlucky in that Minter games have not been available. Until now that is. For creatures who hand over quite a small number of coloured pieces of paper in shops will now be able to play a genuine Minter game at home. The graphics are simple, colourful and flash so brightly that any life form more advanced than humans (dolphins, mice and so on) may find that actual pain is induced. Sounds are similarly psychedelic (if such a word may be applied to sounds) and when amplified are almost, but not quite, totally unlike a Disaster Area concert. There are a large number of levels with which the earth creature may choose to begin the mindless destruction. These proceed with a definite lack of seriousness. Some might say they are fun. They would be right. They are indeed, as they say, fun. Anybody who missed out on Jeff Minter's 'alternative' games on 8-bit can try his psychedelic delights in Grid Runner. The idea of the game is simple: you control a ship with detachable nose-cone. Holding down the right button drags the nose cone around, otherwise it sits where it is and spits your shots into three bullets, dealing mayhem to swoping invaders. And what do you have to do? Avoid the railgun's shots from the sides of the grid, pick up the bonus tokens and blast the Bejesus out of everything else. Simple. 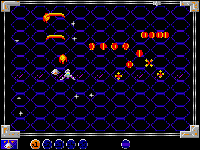 The flashing, cycling and pulsating psychedelic colours are the main feature of most, if not all, of Jeff's games, and indeed Grid Runner has cycling and pulsating colours at every opportunity. The effect is pretty - if a little disorientating - and provide a suitably ethereal backdrop to the gameplay.